On April 2nd at the Martha’s Vineyard Performing Arts Center, artist Stefanie Batten Bland will host a workshop surrounding the company’s upcoming production of Bienvenue欢迎WelcomeBienvenidoأهلا بك performed on April 6th at 7pm at the MVPAC. The first part of the workshop will focus on introducing participants to Company SBB’s dance-theatre vernacular. Community members will explore dynamic decision making both physically and vocally. The second part of the workshop will focus on the subject and materials used in the piece. This workshop culminates with an opportunity to perform Welcome... with the company for the first seven participants who express interest. Participants who perform will need to attend additional mandatory rehearsals throughout the week. Participants must be 16 years old or older. No dance or performing experience is necessary. You may take the workshop without volunteering to perform. Welcome… reuses cardboard boxes to create a conversation surrounding the current definition of walls, what they mean in neighborhood gentrification, how they are employed as cultural barriers and either invite or prevent access to borders. Together alongside Company SBB members, participants will create a mural that reflects the unique community of Martha’s Vineyard. What is made together will be fully integrated into the piece. Please RSVP by clicking the button below to confirm your attendance and let us know if you're interested in performing! Rehearsal times/dates/location will be disclosed upon your response. 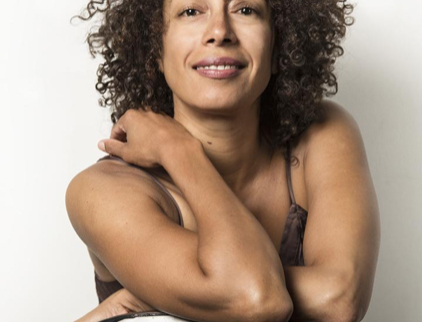 Stefanie Batten Bland is a 2019 American Ballet Theatre Women's Movement Initiative Choreographer. Fascinated by all things that move, Batten Bland is an interdisciplinary choreographic artist whose creations shift between ways of being to bring stories to life.